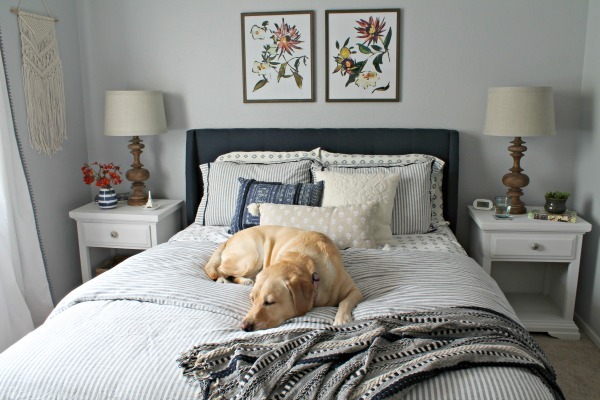 I’m excited for today’s post because it’s about one of my favorite days of our trip! We started our day at the Tower of London (using our London Pass). We got there just after they opened, so it wasn’t very crowded yet. 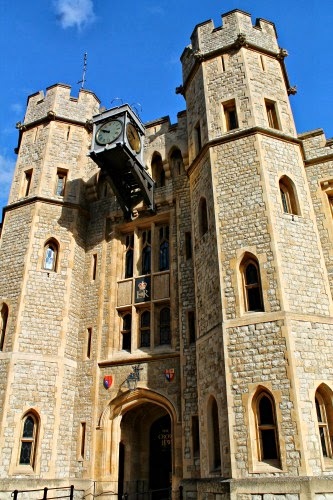 I had read online that you should visit the Crown Jewels early because it can get really busy, so we headed there first. There’s a moving walkway through the Crown Jewels, so you don’t have to worry about other people blocking your view. They should put a moving walkway in front of the Mona Lisa in the Louvre…people were seriously rude there, but that’s a story for another day. Then we walked back to the entrance to join one of the Yeoman Warder (aka Beefeater) tours. I highly recommend taking a tour with them. 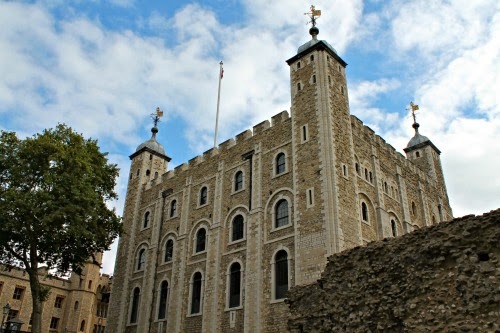 They are seriously entertaining and full of interesting stories and facts about the Tower. They actually live in the Tower with their families, which we thought was really cool. 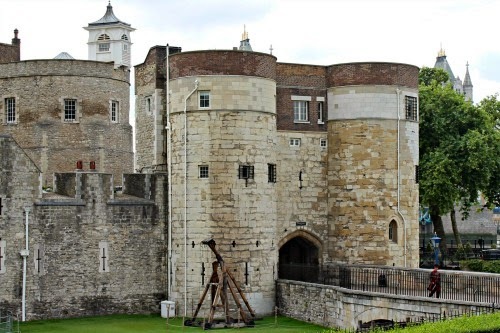 Can you imagine growing up in the Tower of London?! Lastly we walked through the White Tower, the oldest part of the tower (and the most recognizable). 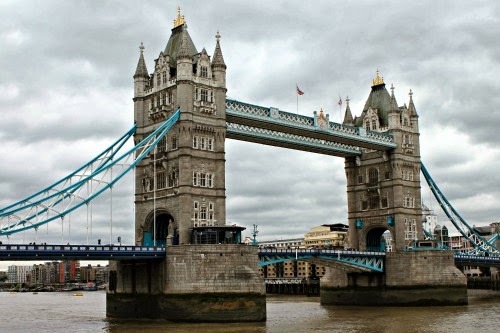 Once we finished at the Tower of London we walked along the river towards Tower Bridge. You can go to the top of the bridge, but we decided to skip that and just take a few pictures. By then it was time for lunch and we were tired of walking, so we decide to eat at the closest restaurant – The Perkin Reveller. It’s right next to the Tower of London. We ordered from the 2-course lunch menu – fish and chips and a chocolate pot for dessert. The fish and chips were good (the tartar sauce was delicious) and the chocolate pot was amazing! I’d definitely recommend this place for lunch if you are near the Tower. With full bellies we headed down to the pier to catch the Thames river cruise to Westminster Abbey. 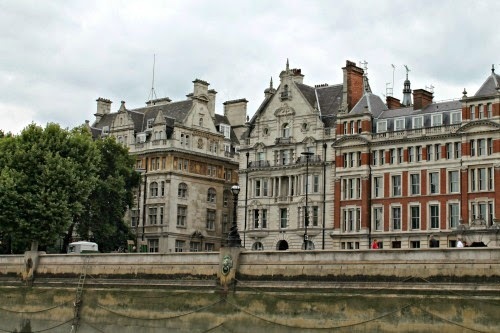 The cruise is included with the London Pass and is a great way to see the city. The weather was perfect, so we were able to sit on the deck outside. 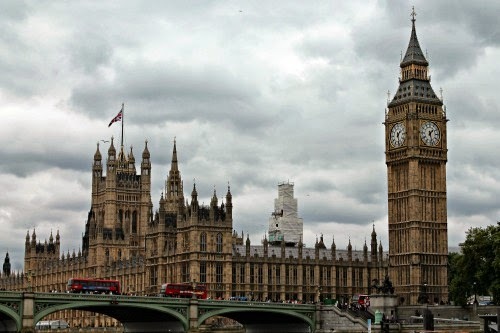 And then there it was, the Palace of Westminster/Elizabeth Tower/Big Ben/Whatever Name is Appropriate, and it was beautiful! 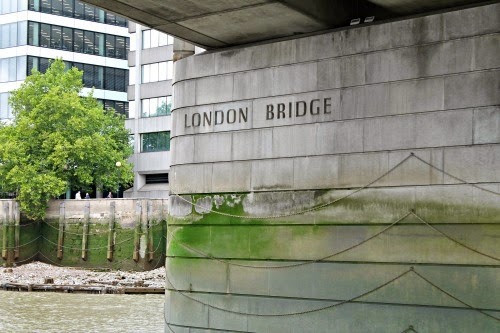 Now I understand why this view is considered iconic London…it’s amazing! 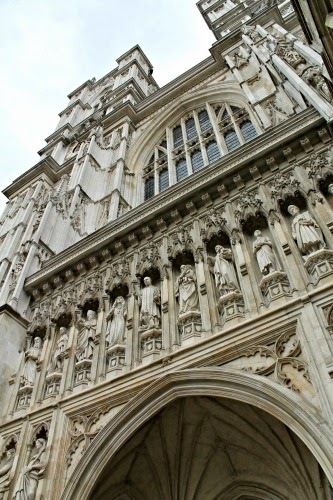 Our next stop was Westminster Abbey (also included with the London Pass), which is next to the Palace of Westminster. You might recognize it as the place where William and Kate were married a couple years ago. On the hour they deliver a short prayer over the speaker system. We were there on September 11th, so the prayer we heard was for all the victims and survivors from that day. I don’t consider myself to be a very religious person, but I have to admit that it brought tears to my eyes. It was one of those experiences that you don’t plan in your itinerary, but turn out to be the most memorable. I was standing next to Sir Isaac Newton’s tomb during the prayer. 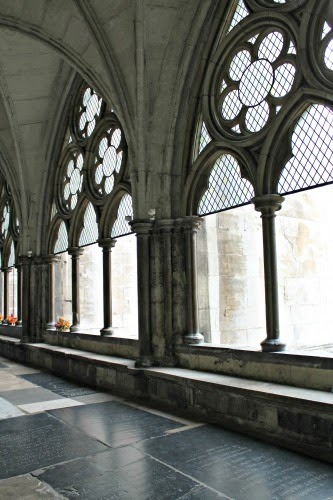 He’s one of many famous people buried in the Abbey, such as Geoffrey Chaucer, Charles Dickens, and surprisingly Charles Darwin. Pictures aren’t allowed inside the Abbey, but are allowed inside the cloisters. Here you can see some of the tombs on the floor. Not to completely change the subject, but Westminster Abbey had a great gift shop too. We bought a lot of our souvenirs there! 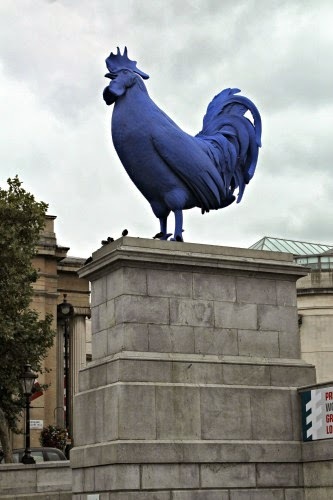 Anyway, we decided to finish off the day with a walk to Trafalgar Square. 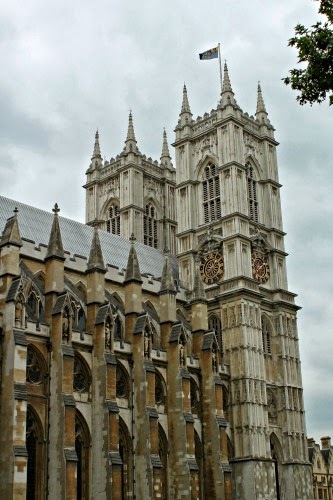 It’s a short walk from Westminster Abbey and includes some fun sights. You can see the street that the Prime Minster lives on – although it’s gated and guarded by police. 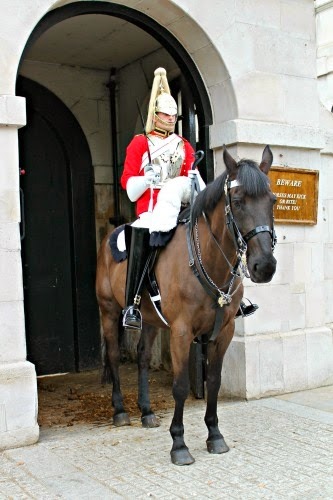 You also pass by the horse guards! 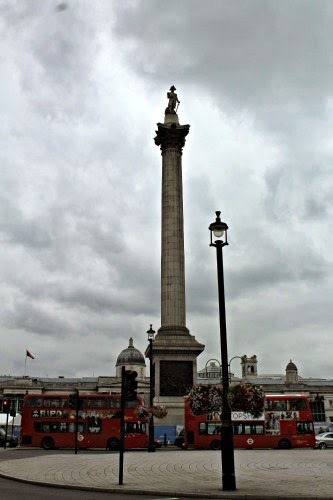 As you approach the square you can see Nelson’s column high in the air. We sat in the square for awhile (next to the blue rooster) and watched crews set up barriers, booths and a large stage. 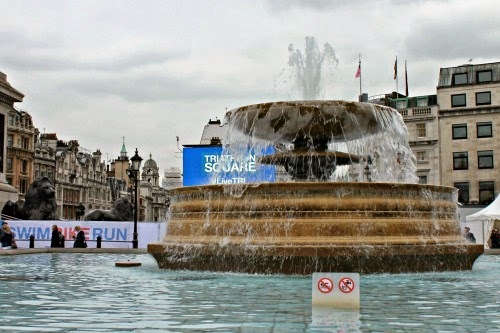 We found out later it was for the World Triathlon which was being held in Hyde Park over the weekend. Eventually they kicked everyone out of the square so they could finish setting up for the triathlon events and we headed off for dinner and back to the hotel to rest up for the next day. Next Week: St. Paul’s Cathedral and Buckingham Palace! So jealous right now Sam, never been to this part of the world and I love seeing pictures and knowing people's experiences of these places!!! Thanks for the lovely photos and hopefully, in a year or two I'll be taking the same snap shots too! Seriously. This is amazing. I am having nerdy reactions to this. I love it. Plus some of the photos you took are to die for! 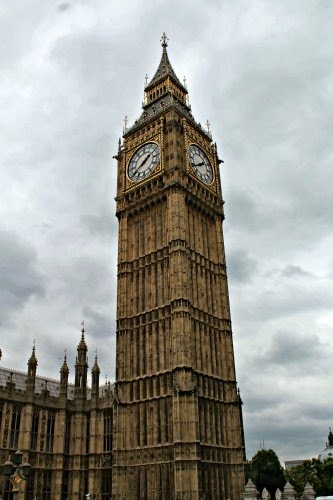 I bet if you were to black and white a couple of the bridge and Big Ben photos they would look fabulous in your office! Holy guacamole I am in awe! I am also so excited that you and your mom got to experience this together. I can't think of anything more wonderful! Plus I is spoiled by you! Which I love a lot! Good pics and cool to keep hearing about the trip! I really liked that area also when I went there.